Shot-gun Collins was a Wells Fargo & Co. messenger. He obtained his name from the peculiar weapon he used, a sawed off shot gun. He killed two men in Montana and two in Arizona. Beyond that his exploits need investigated. "I have a photo and information on my grandmothers first cousin who used the alias Shotgun Collin in Dodge City, He also went by the name of John Collins and John Graham". Abraham G. Graham was born November 22, 1851 on Mitchell Swamp, Horry County, SC on his grandparents, (William Bellamy and Jane Conner Graham's) plantation. His great grandfather, Captain Edward Conner, served in the American Rev. War in the Militia under several different commands and served under and rode with General Francis Marion in the famous Swamp Fox Band. As a young boy his parents, Hosea A. and Martha Ann Graham, first cousins, moved the family by covered wagon from Horry County to Texas. At a young age he got into trouble with the law for rustling cattle and became a wanted man. He left Texas and move out to New Mexico. 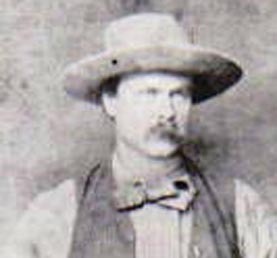 He became a valuable member of Billy the Kid's gang while he was living in White Oaks and surrounding areas of New Mexico, knew Sheriff Pat and his deputy Poe, met Wyatt Earp working for Wells Fargo and the rest is history. He changed his name back before he was killed although his reputation as a feared outlaw, a quick draw and the company he kept followed him into the streets of El Paso Texas. Sometimes he was on the right side of the law and other times he was an outlaw. It was the way of the Wild, Wild West, live by the gun or die by the gun. John had a humorous personality but when it was time to take care of business he was as powerful as they come. " Shotgun Collins" died on December 3, 1922 in a shootout on the streets of El Paso, Texas. November 21, 2008 - I was recently provided an article by Chuck Parsons that came out of True West Magazine January 1999 issue. In the article Parsons claims Collins first name was George, not John and that his parents were either Frank Collins of Virginia or John R. and Elizabeth Collins of Chesterfield Co., Virginia. By March of 1881, Collins was Constable of Wilcox. In April 1882 he was in Trinidad where Bat Masterson was City Marshal. In the spring of 1883 he was helping out Luke Short in Dodge City and on July 11, 1885 he was booked into the Canon City, Colorado Penitentiary for killing William Norris back on February 3, 1885. Prison records list Collins as 35 years old, 5' 7 1/4" tall,blue eyes,brown hair, of medium complexion and build. Records also indicate he had a Rebel Flag Tattoo on his neck with others scars. On November 10, 1891 Collins received an unconditional pardon from then Gov. John Routt. ... as seen through the eyes of one person. Click below to have your Old West items appraised.